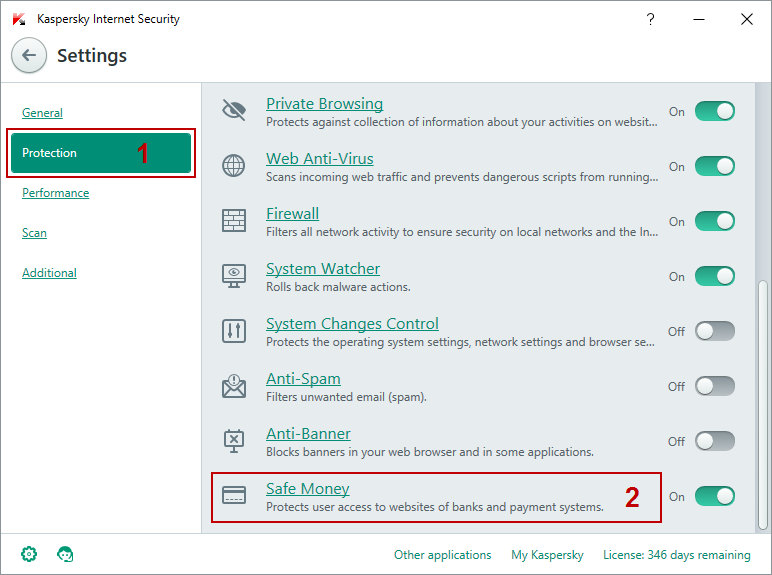 Use Safe Money component of Kaspersky Internet Security 2016 while working with online payment systems or banking accounts (for example, PayPal, Yandex.Money etc.) to ensure the security of personal data and avoid financial loss. When entering your online payment system or banking account, the program prompts you to open the website in Safe Money mode to protect your personal data and prevent data theft. If you agree, the program runs Protected Browser marked with a green frame. If either the Protected Browser fails to run or your OS has critical vulnerabilities, the frame becomes orange and an error message occurs. 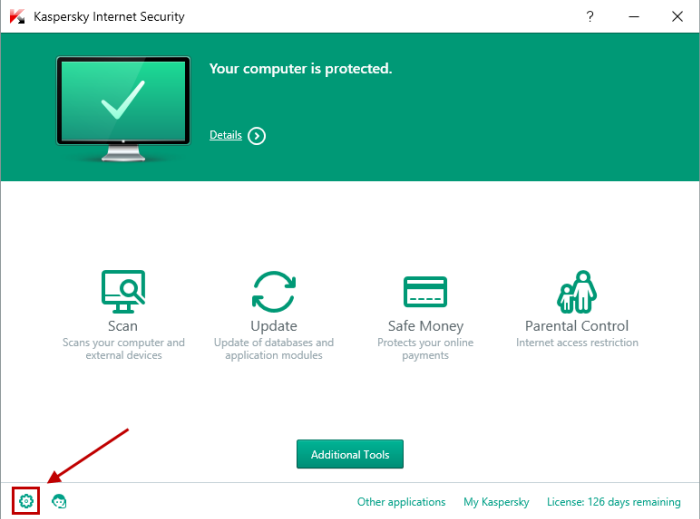 Kaspersky Internet Security 2016 does NOT collect or store any personal information about users. 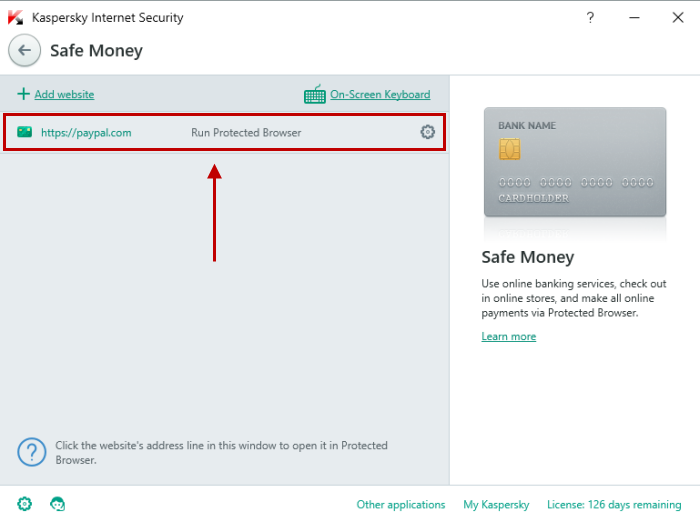 Kaspersky Internet Security 2016 protects your Clipboard data against interception and theft while using the Safe Money mode. The product also prevents unauthorized screenshot capture (powered by the Hypervisor , DirectX , and OpenGL technologies). Check if the Kaspersky Protection extension is installed and enabled in your browser (Internet Explorer, Mozilla Firefox, Google Chrome). Learn how to enable the Kaspersky Protection extension. In the address bar of yourbrowser, type an online banking or a payment system address. Click Open in Protected Browser. 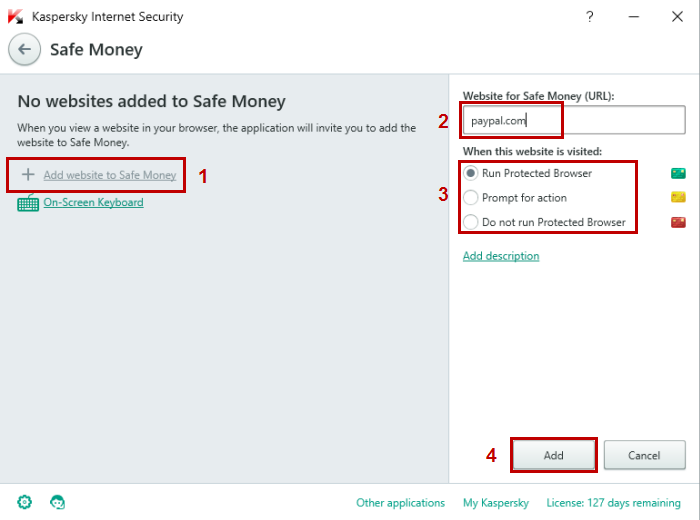 If the application doesn't offer you to open the website in Protected Browser, add its address to the Safe Money database (see below). Safe Money has a list of websites which includes most popular online payment services and shopping platforms. These websites are opened in the Protected Browser by default (the browser frame becomes green). In the Safe Money window, click the link Add website to Safe Money. Type the website address in the Safe Money website (URL) box. Select an action to be taken whenever the page is open. Click Add website to Safe Money. In the left part of the window, a new entry will be displayed. The website you have added will be opened in the Protected Browser from now on. In the Settings window, go to the Protection section. In the right frame, scroll down to the Safe Money section and slide the switch on or off by clicking on it. 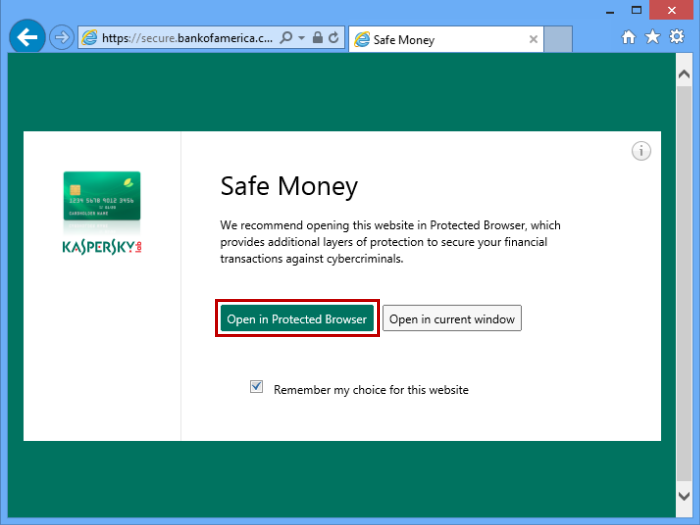 Please note that Safe Money works only when Self-Defense is enabled in Kaspersky Internet Security 2016. 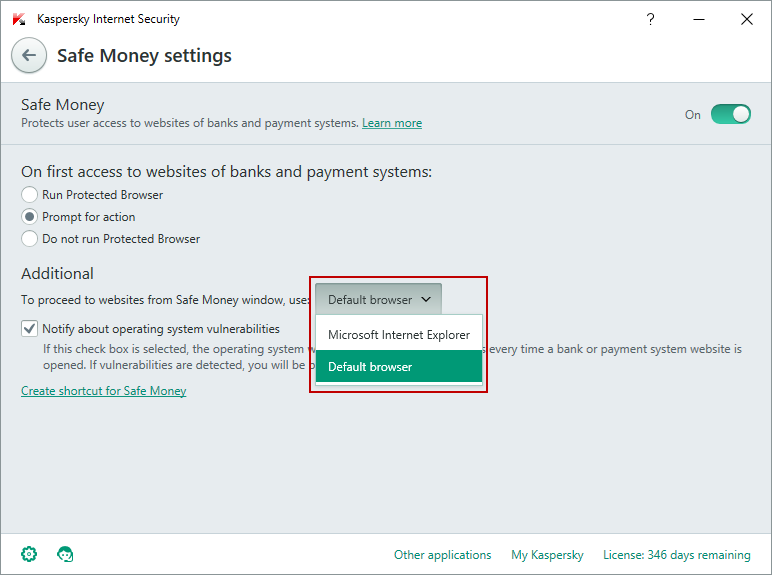 You can also run Safe Money using the desktop shortcut that was created during installation of Kaspersky Internet Security 2016. Open the Settings window of Kaspersky Internet Security 2016. In the Settings window, go to the Protection section and select Safe Money in the right frame. In the Safe Money settings window, find the Additional section and indicate the browser that should be used in Safe Money mode. The certificate obtained when establishing secure connection does not match the original certificate .